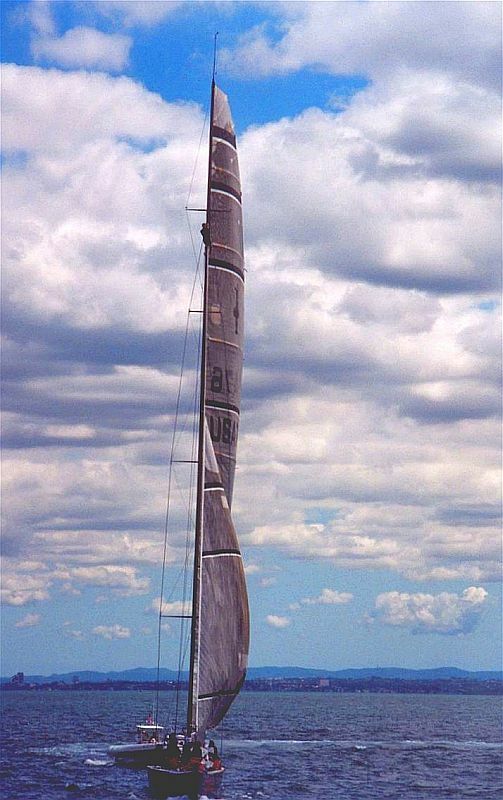 In Auckland, New Zealand during the 2002-2003 summer, the Louis Vuitton Cup and the America�s Cup were being raced on the Hauraki Gulf. We were closely involved with the Oracle BMW Racing Syndicate, owned by Larry Ellison, and his boat USA 76, as one of our sons was on the crew. USA 76 reached the finals of the Louis Vuitton Cup, but was beaten by Alinghi, the Swiss challenge that went ahead to take the America�s Cup off Team New Zealand. We went out many times on the spectator boats to watch the races and I took as many photos as I could on my old trusty 35mm Pentax camera � oh how I wish I had the digital then. Out on the spectator courses we were not allowed to get too close to the boats racing, but I did my best with the 160mm zoom lens. Here is a photo of my son up the 120 foot mast of Oracle BMW USA. Mostly Cameron hung out at around 90 foot-ish mark. He said, �It was very jerky, moving around a lot in waves and spectator boat wakes. You have to hold on very tight.� And when asked if he got seasick his reply was, �Sometimes in training I didn't feel too good, but never when racing.� Too much excitement going on. I know the photo isn�t too clear, but it is a great reminder of our exciting Cup racing season. I have scanned the photo and tried to brighten it up, but I wish it was clearer. Wonderful note and the picture goes along with it well. I agree the photo is not as clear as it should be . however you captured an important moment . I try a workshop in the hope you like it ? Nice one again, grainiy though. You have a very lucky son!